Each year, Light Up To Live provides specially selected dogs and funds to raise and train service dogs for our Veterans. 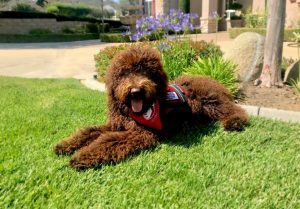 The Patriotic Service Dog Foundation is a non-profit organization that is focused on serving Veterans by raising awareness for their needs and providing service dogs to those who may benefit from long-term mental and physical assistance. 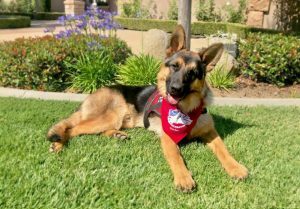 Through the Patriotic Service Dog Foundation efforts, wounded Veterans are matched with highly trained and skilled service dogs that allow their new partners to become more independent, self-confident, and comfortable with life outside of the military. 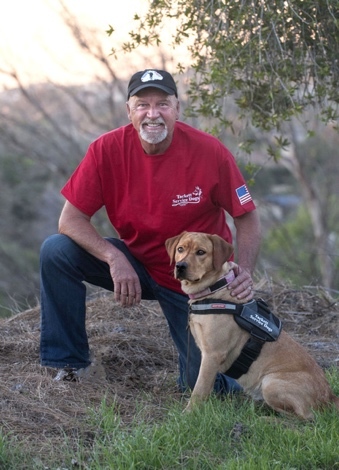 Their close-knit community of volunteers and professional trainers work alongside Veterans to develop lasting and meaningful bonds with dogs that provide so much more than just companionship. According to the Patriotic Service Dog Foundation, there are an estimated 460,000 Veterans from the Iraq and Afghanistan war who are struggling with Post-Traumatic Stress (PTS) or Traumatic Brain Injury (TBI). One of the most difficult statistics to read is that approximately 22 Veterans take their own lives every day. The Light Up To Live Foundation is working to find ways to help provide support, hope and help to our military men and women, especially those who are returning home from active duty and entering civilian life again.  The Light Up To Live charity, founded by Randall and Sherry Reed, first partnered with the Patriotic Service Dog Foundation in 2018. The Reed family was proud to be part of helping provide two very special service dogs, Gentle Ben and Jackel, named after two fallen heroes. During the 2018 Gala, multiple patrons donated funds via Light Up To Live to help raise and train Gentle Ben and Jackel. Upon completing training, each will be paired up with a Veteran in need. Tom Tackett is a behaviorist and competition dog trainer based in Orange County, CA since 1977. As a recognized authority on obedience and protection training, Tom has appeared as an expert witness in court cases and on numerous local television programs. Competitive in Schutzhund Trials, he won the first all Rottweiler National Schutzhund III Trial in Florida in 1985 with a perfect score (100) points in protection. While in Germany acquiring “Arras Zur Spielmans-Au”, the 1985 European Champion and World Champion Rottweiler, Tom was certified as a Schuzhund Trial Decoy by the German Rottweiler Club (ADRK). He was president of the Southern Counties Rottweiler Club from 1992-1995. With an emphasis on continued education, he has sponsored numerous Police seminars. Additionally, he has composed nationally distributed audio tapes on dog behavior for veterinarians; written articles for the Orange County Register entitled, ”Dogged Dilemmas” from 1992-1995. California & Orange County Rehabilitation Programs recognized Tom’s school for Trainers from 1988-1996. In August of 2006, Tom and his Black Lab, “Kona” were certified as a “Certified Mold Detection Team” at Vom KaiserhofeTraining Center” in Lawrence, Kansas, as well as with the “World Detector Dog Organization” based in Vincent, Alabama. In December 2009, Tom and “Hark Vom Schwarzen-Eis” completed the “BH” title. That is the obedience and traffic sure title pre-requisite for Schutzhund. Tom is also a CGC evaluator for AKC, a Professional Premium member of APDT, and a Professional member of IACP, and certified evaluator for the Foundation for Service Dog Support, Inc. Tackett Service Dogs, Inc.
Visit our events and donate page to learn how you can be part of helping Light Up To Live continue to support the Patriotic Service Dog Foundation.